Marlow can be reached by train or bus. The train, known locally as the Marlow Donkey, runs via Bourne End to link with the main line at Maidenhead. It provides an excellent service and operates every day. There is a regular bus service between Marlow and High Wycombe [Arriva] and also with Reading [Arriva]. The town has an excellent Information office in Institute Road, just around the corner with the High Street. This is operated by the Wycombe District Council. Much useful information is available there. 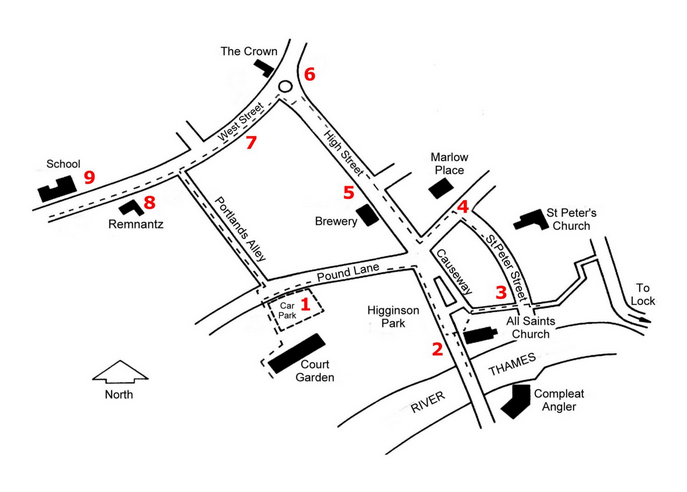 These notes and the map are based on the Marlow Society publication Marlow Town Walk. 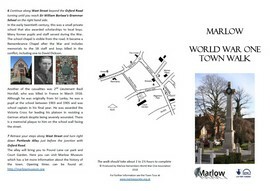 It is available from the Society and from the Information Centre in Marlow High Street. If you wish to wander around the town it is well worth the 50p it costs. Better still why not take a tour organised by the Local History Group which will provide you with much more information than we can cram in here! Court Garden - a convenient starting point for visitors - is in Pound Lane, with a large public car park which is very busy at weekends. Turn right at the twin mini roundabouts at the bottom of Marlow High Street (just before you come to Marlow Bridge) and continue to the next mini roundabout (about a quarter-mile) and Court Garden is on your left. Click here for a detailed map . Court Garden now houses the Marlow Leisure Centre and Shelley Theatre; it has access to the River Thames. Walk round to look at the back of the house which was built in the mid 18th century by a Dr Battie, (who specialised in nervous diseases). He designed it himself and is said to have forgotten at first to put in a staircase. It is rumoured that this is where the expression 'batty' originated. Children - and adults too - love to feed the swans which gather along the towpath alongside Court Garden and Higginson Park. 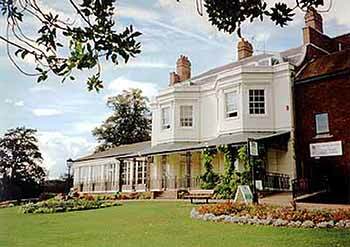 The house and surrounding park were bought by public subscription in Marlow in 1926. The presentation to the town was made by General Sir George Higginson, (a veteran of the Crimean war), at a ceremony to celebrate his 100th birthday. The park was named after him and now contains a statue of Sir Steve Redgrave, erected following his record fifth gold medal for rowing at the 2000 Olympic Games. 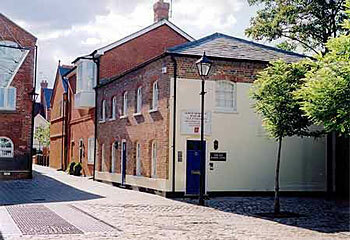 The Marlow Museum, located in front of Court Garden is open during the weekends. Its Summer opening hours from March 1st to the end of October are Saturdays, Sundays and Bank Holidays 1pm to 5pm. Winter opening hours from November to February are Sundays and New Year's Day 2pm to 4pm. 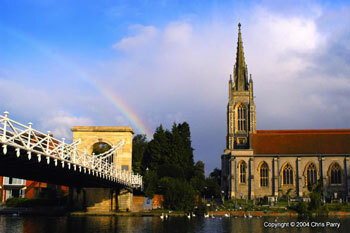 (2) Marlow Bridge, All Saints Church, The Compleat Angler and the Causeway. The present suspension bridge was built in 1832 and was designed by Tierney Clark who used the same overall design for bridges at Hammersmith and Budapest. All Saints Church was rebuilt in 1835 but there has been a church on more or less the same site since at least the 11th century. It contains many interesting memorials and hatchments, including a monument to William Horsepoole (1624), related by marriage to George Washington. From the bridge there is a fine view of the river, the weir and lock and the famous 'Compleat Angler' hotel. The statue on the Causeway is a memorial to Charles Frohman, a famous theatrical impresario, who went down with the 'Lusitania' in 1915. This ancient street, with its varied mix of old dwellings, runs down to the Thames and all previous bridges crossed the river from this point. During the Civil War in the 17th century the street, which now is free of through traffic (for it ends at the river's edge), was heavily defended to protect the river crossing. Saint Peter's Church can be seen through the arched gateway Note the interesting houses and cottages and also, on the right, Saint Peter's Roman Catholic Church designed by Pugin. Seen through a pointed archway the church, built in 1845-8, is most notable for its broached spire. Pugin also designed the individual school and master's house close by. Next cross the road at the top of Saint Peter Street (Station Road) to Marlow Place. The finest of all Marlow's Georgian houses, Marlow Place, facing Saint Peter's Street in Station Road, is a highly ornate box of a house complete with pediments, pilasters and a grand external staircase. It was built for John Wallop, first Earl of Portsmouth and stylistically attributed to the architect Thomas Archer -circa 1720. In the 1950s it housed a girls' finishing school and today serves as very handsome offices. From Marlow Place you will have a good view back to the Old Parsonage - probably the oldest building in Marlow town; parts of it date back to the 14th century. Walk along Station Road and turn right into the High Street. Keep to the right hand side. On the opposite side of the road note the elegant town houses associated with Marlow's Brewery. Seen from the High Street through the archway of the old Brewery gateway, Marlow's brewery buildings now form part of a high quality housing and office development which has been recognised as an outstanding conversion from commercial to domestic use. They formerly housed the town's principal industry. Wethered's Brewery was founded in the mid-18th century, transferring from the east to the west side of the High Street where it had its own artesian well. Long a major employer and famed for the quality of its products, Wethereds was taken over by Strongs after the Second World War, then absorbed by Whitbreads and sadly closed in 1988. Moving on further you will then pass on your right the early 17th century Chequers Inn and also Cromwell House, a 17th century classical town house. Look up to see the plaque commemorating Edwin Clark, a famous Victorian engineer. Other buildings in the street have interesting facades, often the result of refacing older properties. These can be seen by looking up above the shop fronts. 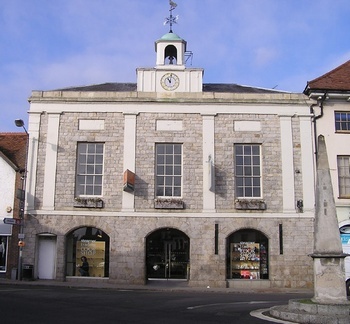 The Crown was built in 1807 as the town's Market House, replacing the former wooden building. It has a fine Assembly Room on the first floor. The original Crown Hotel, which was a famous coaching inn stood immediately to the right of the present building and is now shops and offices. The Obelisk commemorates the Hatfield to Bath turnpike road. The Town Clock: Until recently the clock, atop The Crown, had been rather overlooked and almost forgotten as a valuable component of Marlow's history. In collaboration with Marlow Town Council the 'Tempus Fugit' Group, led by Tony Shannon, was set up to restore the town clock in time for its bi-centenary on 3rd April 2005. The work included restoration of the face and turret and removal of the original works (to be removed and stored in the Public Library pro tem) replacing them by a modern electric drive and striking system. The Crown Town Clock model went on display in Wycombe Museum. As supporters of the project, our Local History Group prepared a summary of the clock's history to accompany this. The clock was given to the town in 1805 by Pascoe Grenfell (M.P. for Great Marlow 1807-1819) an associate of Sir Thomas Williams (The Copper King). Williams presented the Market building to Marlow in 1807 as a Town Hall comprised of a covered market, fire station and assembly room. The sequence of these dates suggests that the clock might originally have been placed on the 17th century market house, which stood in the middle of Market Square. Walk past the Ship Inn which has 17th century timbers, reputedly from former warships. T S Eliot the poet and Thomas Love Peacock, the author both lived in Marlow for a short time and are commemorated by plaques high up on numbers 31 and 47. Remnantz in Marlow's West Street is a large early 18th century red brick house which, during the years 1801-12, served as part of the original Royal Military Academy. 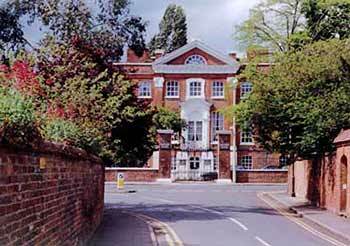 It housed the junior section of the Royal Military College for about ten years before it moved to Sandhurst. The house was originally 4 storey. The top storey was removed in the early 19th century some time after the Royal Military College left. Subsequently the Wethered family who owned the town brewery bought Remnantz and lived there until recently. Note the weather vane atop the Remnantz stable block. This splendid stable block in the Wren style, which is now converted into two dwellings, adjoins the main house. The wooden clock tower is surmounted by a cupola and the weather vane has a small man firing a cannon, recalling the military use of the building. In 1624 Sir William Borlase founded in West Street, Marlow, a free school to provide basic education for 24 poor boys, to 'read and write and cast accounts' and 24 poor girls to knit, spin and make bone lace. It is now a mixed grammar school. His original building still stands proud amid much enlargement of the 19th and 20th centuries. The whole edifice on the north side of West Street beyond its commercial sector presents a fine example of gabled brick and flint structure centred upon a high archway. 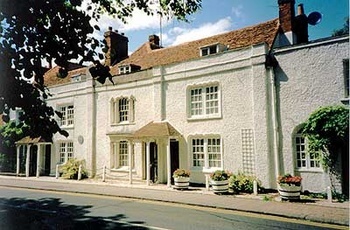 Shelley Cottages - To the right of the school in West Street is Albion House, one of the pretty row of whitewashed cottages with Gothic windows, marked by a plaque. Here the famous poet Shelley and his wife, Mary, lived. This was their home for a year from 1817-18 before they went to Italy. While Percy Bysshe Shelley's work is world renowned, it was his wife's creation of her novel, 'Frankenstein', while at Marlow, that gained the greatest popular fame. Intricate ogee shaped window frames give the property its Gothic touch but the true Gothic influence obviously came from within. Retrace your steps to the small car park on the south side of the street. Portlands Alley, which runs beside it, will take you back to Court Garden.